The Infiniti QX50 is a Compact luxury crossover SUV. 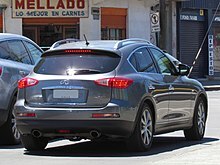 The first generation QX50 is a minor model update of the Infiniti EX, while also changing the nameplate to QX50 in line with the marque's new Q and QX nomenclature, which took place for the 2013 (China) and 2015 (United States) model years. The second-generation QX50 entered production in November 2017 as a 2019 model. GQ magazine named it one of the 10 best luxury SUVs three years in a row. The vehicle was unveiled in 2013 Nanjing Auto Show. Middle East models went on sale as 2014 model year vehicle. Early models include VQ37VHR 3.7-litre V6 (326PS) engine with all wheel drive, 7-speed automatic transmission with manual shift mode, DS mode with Downshift Rev Matching (DRM), and Adaptive Shift Control. US models went on sale as 2014 model year vehicles. Early models included QX50, QX50 AWD, QX50 Journey and QX50 AWD Journey. China model was set to go on sale in 2015. Production of the Chinese models of QX50L at Xiangyang plant in Hubei Province was set to begin in 2014. Infiniti QX50L was used as the actors' official passenger vehicle for the Where Are We Going? Dad (爸爸去哪儿) television series. Changes include overall length increased by 80 millimetres (3.2 inches), a redesigned grille and front bumper assembly that incorporate LED daylight running lights, optional automatically opened and closed tailgate hatch, optional full panoramic glass roof. The vehicle was unveiled in 2014 Guangzhou motor show, followed by 2015 New York Auto Show. Delivery of China model began in February 2015. It included 21-inch wheels, black and white interior upholstery. The vehicle was unveiled in 2016 Beijing Motor Show, followed by 2016 Paris Motor Show (with gray body colour, 22-inch wheels in bronze, brown leather interior upholstery, 2.0-litre inline-four variable compression engine with compression ratio between 8:1 and 14:1), 2016 Los Angeles Auto Show (with black and white interior upholstery). It included 2.0-litre inline-four variable compression engine with compression ratio between 8:1 and 14:1, front-drive platform. The vehicle was unveiled in 2017 North American International Auto Show. The production version of the second-generation QX50 was unveiled at the 2017 LA Auto Show as a 2019 model. It features a turbocharged 2.0L KR20DDET gasoline engine equipped with Nissan's VC-T variable compression ratio system. Production began in November 2017 at Nissan and Daimler AG's joint plant in Aguascalientes, Mexico. ^ "Home". Oami.europa.eu. Retrieved 2016-03-15. ^ "A Uniquely Personal Expression of Style, With Standard 3.7-litre V6" (Press release). Infinitipress.me. Retrieved 2016-03-15. ^ "Katy Perry to Perform at Infiniti Brand Festival in China". Infinitinews.com. 2013-12-09. Retrieved 2016-03-15. ^ 英菲尼迪(进口)-英菲尼迪Q50 (2013-04-22). "英菲尼迪2014年国产Q50L/QX50L两款车". Autohome.com.cn. Retrieved 2016-03-15. This page was last edited on 14 March 2019, at 04:43 (UTC).